The last few days have seen some speculation - largely by the NYTimes - that Henry Kravis might be interested in Harley Davidson (HOG). "But with careful structuring, there seems to be room to gear up, Breakingviews says. Only $600 million of Harley’s $5.7 billion of debt relates to the manufacturing part of the business, according to Wells Fargo estimates. For leveraged buyouts, depending on the deal, banks are starting to stretch to debt multiples of 5.5 times Ebitda. 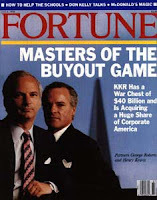 At that multiple, Kohlberg Kravis or another private equity buyer could borrow some $4.6 billion and would need to come up with about $3.9 billion of equity, or 46 percent of the total, a big but feasible sum." Hmmmm. Mixed feeling here, as it can be unwise to buy a company like this when market share is peaking (General Motors rings a bell). As for the deal's numbers, they can definitely work out. Maybe not with 2004-2007ish levels of private equity (meaning the actual equity will be a much higher %), but it can be done. The company pulled back heavily of SG&A spending, but it is still a massive number compared to revenue. The finance division will have to be treated with kid gloves, as the company is in the position of financing purchases of its own products.